Chart margins are the distances from the outermost chart borders to the borders of the plot area. 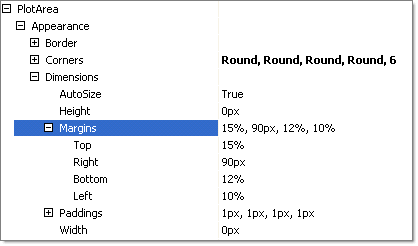 Margins are expressed in the RadChart PlotArea.Dimensions.Margins property and are specified in pixels or percentages. 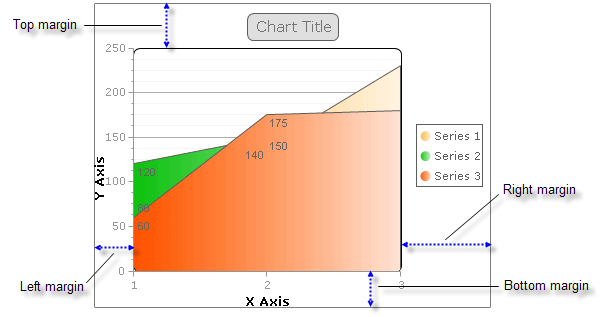 Percentages refer to a percentage of the RadChart width. In the figure below the dimensions are populated with some values in percentages, some in fixed pixels. To provide extra space for positioning legends, labels and title, use greater margin values for the PlotArea to provide room.